As technology advances, the demands on the transmission rate in our data networks also increase. This also reduces the margins in the components, which imposes even higher demands on the installers regarding theoretical and practical knowledge of the products and data networks. In order to increase the quality, secure the function and minimize costs, we therefore offer installation companies free courses in the form of certification courses where we want to provide information about Eurolan products and what it takes to install a residential or real estate network. The certification course is primarily aimed at installers who have a basic experience from the installation of computer networks, but also to project managers, consultants, etc. who want to immerse themselves in the subject. The courses consist of theory as well as practical exercises. 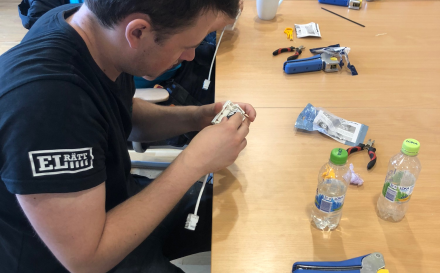 During the practical exercises, for example connector of copper cable with our different types of connectors and cables, switching on and unloading boxes and panels. The theoretical part includes link classes / component standards and the difference between them, measurement and troubleshooting. The training is conducted in our own training facilities in Bromma with a maximum of 10 participants. If there is a larger number of participants from the same company, we will be able to complete the course at the company's address if you prefer. Contact Katarina Ohlson katarina@eurolan.se for agreement on date. After the training, the company receives a certificate and is therefore entitled to submit certification projects via our website. As the project is approved by us and the company has obtained a plant certificate, you can leave a 25-year system guarantee to the end customer. Fill in the form below to register for any of the course events.